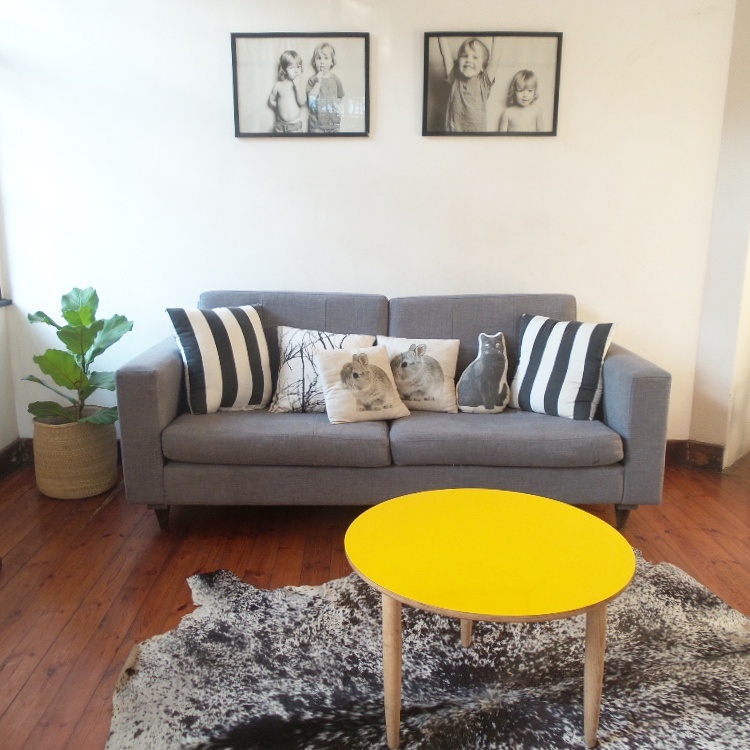 The Rabbit Haus | Our lounge make over, part one! Our lounge make over, part one! We’re doing a bit of a lounge make-over at the moment. Winter is here and every day is getting colder and more miserable around here. While so many people seem to love this kind of weather, it really just makes me unhappy. I love the outdoors and sunshine! Now that we’re spending more time indoors, my restless spirit decided it was time to re-vamp the family room and refresh our living space. If we have to be inside, then at least let the room be as beautiful as can be! Doing a living room make-over can be pretty affordable, and fun. Also, it’s pretty darn easy. All we did was buy 2 liters of paint an some brushes and masking tape (R200 – R300) and chose a colour that we both love. We chose the ‘main’ wall in the lounge and Graeme and Noah painted it a beautiful cement grey. 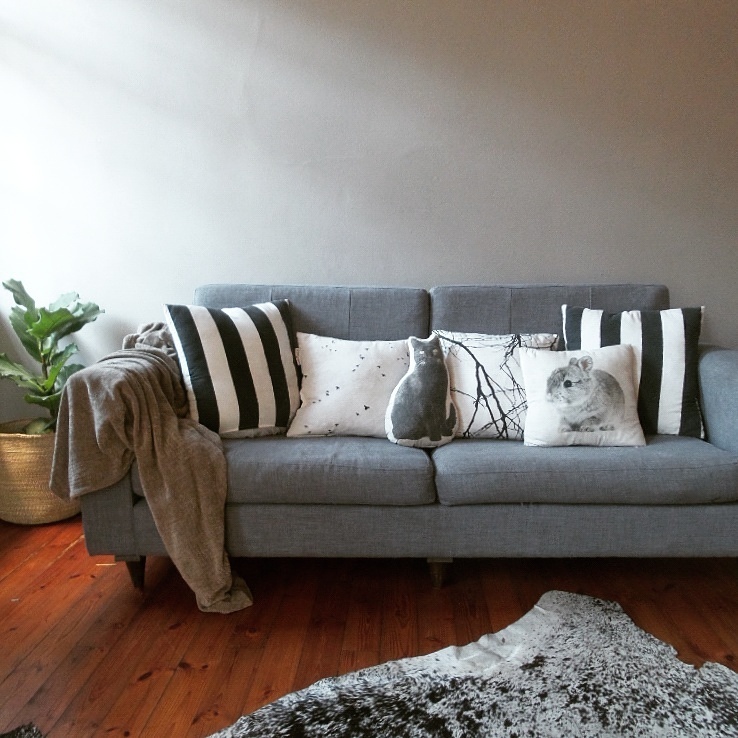 I got a few new pieces of wall art from The Foschini Group‘s @home online store. I’ve mentioned them a thousand times before, because they really have the most beautiful decor pieces. I’m on a first-name basis with the delivery guy at this point! So this is what the lounge looked like before: Quite minimalist and monochrome. When we moved in to our new home, we sorta just hung things up and got all the rooms ‘good enough’ because we were waiting to hear on the boys’ school applications and so on. Now that they’re both rooted at our dream schools, it’s time to settle in and nest for keeps. When we’re done with the complete make-over, I’ll spend some time telling you guys where everything’s from and where to find similar pieces if you’re keen on creating a similar look! I’ve also taken some profesh photos which I’ll share with you once the project is completed. Last weekend, we got the basics done. 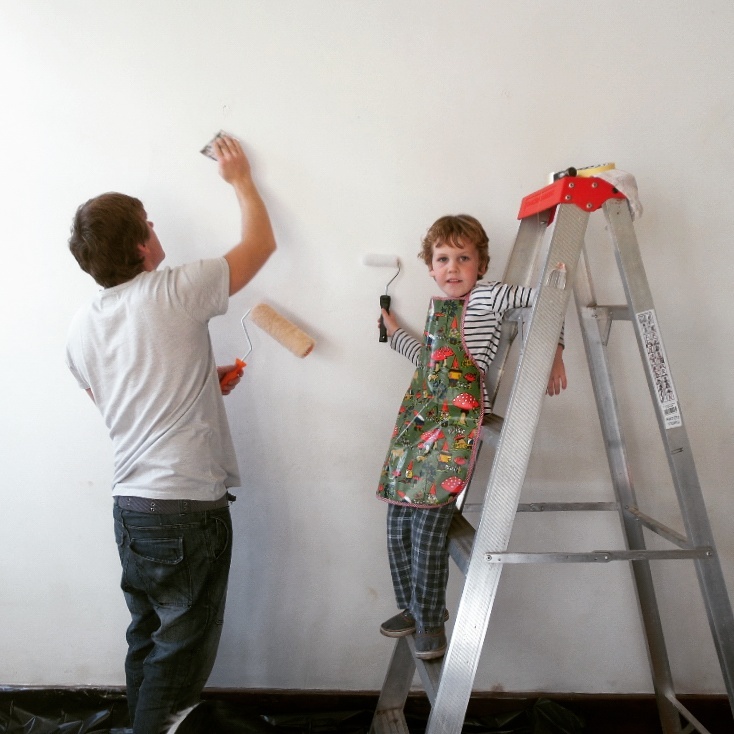 We painted that main wall, then Noah and I started the prep for the artwork. 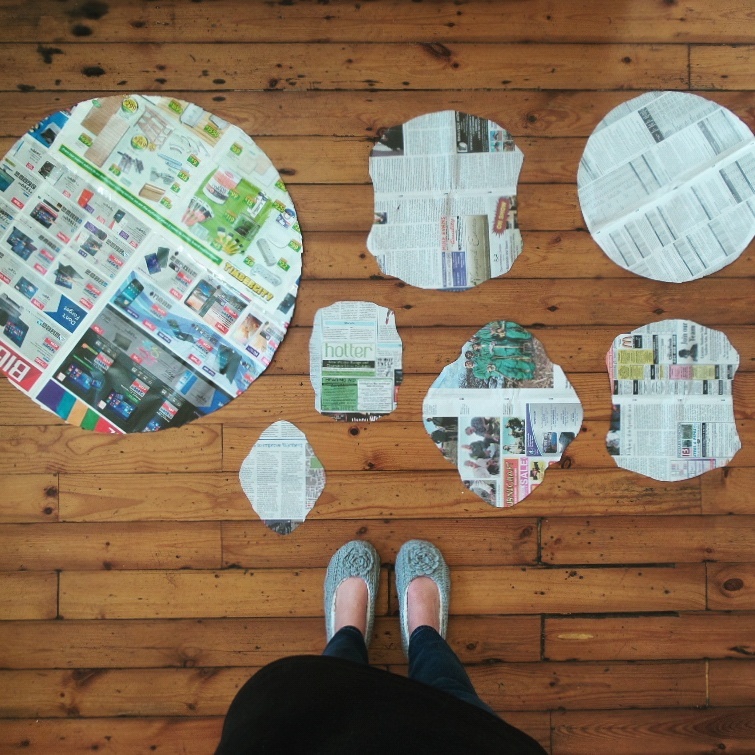 We cut all the shapes out of newspaper so that Graeme and I can try figure out the layout on where everything’s gonna go. Creating a gallery wall is super tough you guys – one picture even slightly out of place and the whole thing looks weird. No pressure! This newspaper method is also great for marking where hooks are placed on the artwork, so you can just mark it, stick it all to the wall and drill in to the markers. And now, it’s time to put up all the art. Graeme and I have had little disagreements on where everything should go. Even Noah got involved in the bickering and has his own opinion on what should go where. We’re having a lot of fun with this and I love that the whole family is getting involved. 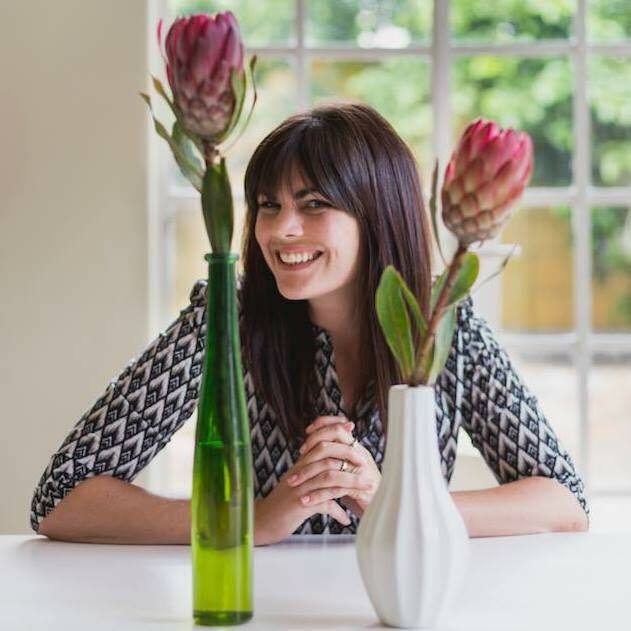 Go and LOOK at some of the gorgeous wall art pieces that @home has at the moment, including their already framed protea, aloe, figs and artichoke prints. Once we’ve finished our little space I’ll show you which pieces we used, and how we incorporated it in to our existing space. Winter really is for nesting!